(CNN) - Forty-six percent of Americans believe that God created humans in their present form at one point within the past 10,000 years, according to a survey released by Gallup on Friday. "Despite the many changes that have taken place in American society and culture over the past 30 years, including new discoveries in biological and social science, there has been virtually no sustained change in Americans' views of the origin of the human species since 1982," wrote Gallup's Frank Newport. "All in all, there is no evidence in this trend of a substantial movement toward a secular viewpoint on human origins." According to Newport, a belief in creationism is bucking the majority opinion in the scientific community - that humans evolved over millions of years. "It would be hard to dispute that most scientists who study humans agree that the species evolved over millions of years, and that relatively few scientists believe that humans began in their current form only 10,000 years ago without the benefit of evolution," writes Newport. "Thus, almost half of Americans today hold a belief ... that is at odds with the preponderance of the scientific literature." 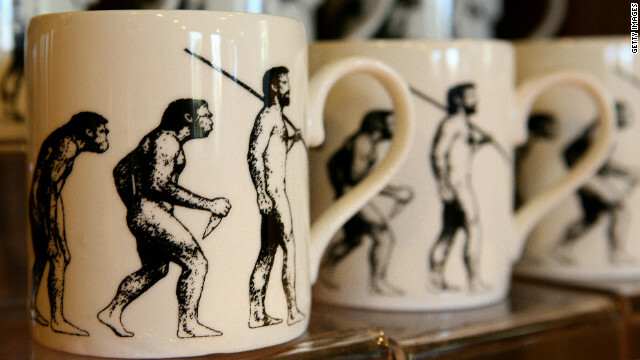 that half of Americans believe in creationism. Sad that they can vote. What are the statistics for believing in creationism in other industrial countries, such as Europe? In Europe, Creationsim is regarded as an invention of American Calvinists (ie: fundamental religion) and is not subscribed to. Immigration in Europe is resulting of an influx of fundamenatlist christians and muslims who tend to believe, and so they bring the average up to 10% in Europe. Those who believe in me, I command you to go jump off a 30 story building, and I will save you. If you don't do this, you do not believe in me. Now go. There are no scientific reasons to accept a creationist viewpoint, sorry. But thanks for playing. The thing I find amazing is how passionate those who are not Christians are in suggesting that anything a Christian believes about origins isn't scientific. Though no one can prove origins (creation or evolution) the reality is there is plenty of true unadulterated science to back up a position of faith in creation. For one, it's been established as biological law since the 1800's that life only begets life... there is no spontaneous generation that has ever been observed or proven. Yet, evolution has to believe this despite it contradicting scientific facts. There are no major fossil transitions. A T. res is a T. rex all the way through the fossil record during it's existence. So is a beaver, so is a stegosaurus, so is a frog. The claims of intermediate forms are largely unique specimens that are probably their own species but you find nothing that is a major transitional form. Sorry, but different varieties of horses don't count as transitional fossils. They are still horses. Show me a horse becoming a bear and you have something else. Then there is the interesting fact that there is twice as much ocean sediment on the continents than there is on the bottom of the ocean today. I mean, everybody can do what they want with the information, but, at least be honest enough to understand that there are plenty of scientific reasons to accept a creationist viewpoint and confirm faith. Just as much as there is a lot of holes with evolution that make evolution a position of faith as well. I feel bad for you, I really do. For being so mind-bendlingly uninformed and misled by those you consider leaders. It really is sad what religion does to the human mind. How about you go educate yourself and post again. Creationism has no scientific basis at all. Zero. Zilch. Nada. We know for a fact the earth is older than 10,000 years. We know for a fact that we humans, within our historical record, have evolved. The ability for you to drink that beer, a few days ago? Yeah. Alcohol is a toxin, bud. Without your ancestors drinking beer as the only source of purified water and thus selecting for people with the ability to code for alcohol dehydrogenase to process it, you wouldn't be able to stomach more than a pint. Guess what? Most of the world population can drink now! Why? Because we selected for it! Evolution! We have full fossil records of a myriad of species, showing their gradual transitions from precursor species. Oh yeah, we've also done some experiments... 60 years ago, for example, Urey-Miller PROVED that you can form organic molecules from inorganic chemicals in an early earth environment. Please go educate yourself, young sir. You've been sadly misled, and close to 50% of this country apparently has as well... I literally cannot believe America sometimes. This is pathetic. It is easy for us atheist to simply say "You are so stupid" and get FURIOUS with these zealots for their beliefs, because we are so sick of hearing this nonsense from them. We would never say to a person who can't read "You are horrible, you can't read." These people who spout this nonsense are VICTIMS. Religion is abuse. We don't go around taunting adults by saying "You are a horrible person, you were a victim of child abuse." These people have been abused by religion since childhood, (and many will want to kill me for saying so) but don't forget, religion is child abuse.